Contemporary, Modern Slab custom Executive Desks and custom credenzas handmade in Montana and shipped worldwide. This credenza has more of a traditional feel with a less traditional selection of woods. The majority of the wood in this credenza (top, frame and drawer fronts) is walnut with the sycamore panels to contrast the darkness of the walnut. 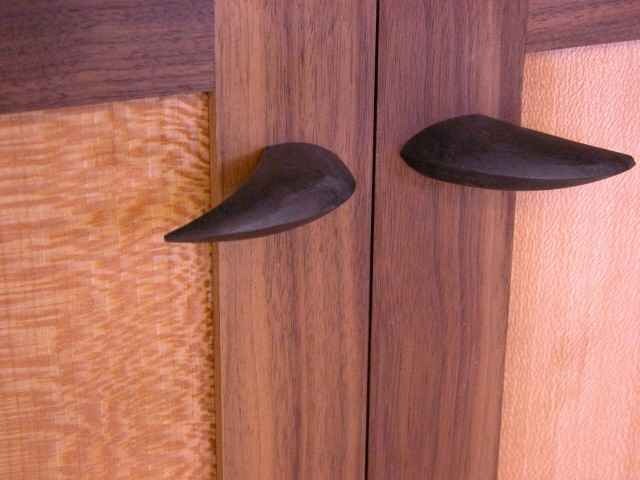 The ebony door pulls on this custom credenza are carefully shaped by hand to a delicate curve that resembles a bear claw. Close up of Quarter Sawn Sycamore grain in side and back panels of credenza.